Oops, I haven't posted in a while. I recently finished a project that I'm not sure if I can talk about, and currently working on a different project that I'm also not sure if I can talk about. I'm also working on Code Geass novel #3 and Shugo Chara #9. I'm also preparing for Anime Expo 2009. This year I am working for Company G, who has two Guests of Honor. So I am also busy watching Gurren Lagann. I'm not officially translating for the GoH's, but I will be hanging out with them. I'm mostly there to take care of the CEO. So, yeah, I've been pretty busy. I'm also still working on getting my wrist nice and healed. And honestly, that takes up a good chunk of my day. I hope I can update again before AX, but if not...see you all at AX! A friend works at Company SE, and he happened to work on the FF7 ACC blu-ray. So we decided to have a viewing party, since I had just gotten a new TV. I wasn't really watching because I'm not a FF fan. (And I had to finish Shugo Chara #8). It was very pretty to look at, though. Anyway, please check it out. I went to E3 to see my video game industry friends. First I went to see my new friend named R I just made at Fanime. He was working at the Company NB booth. I'm looking forward to their We Cheer! 2 game coming this October. I later went to go see my friend M at the Company SE booth. Sorry, I didn't take any pictures here. It's because they had nothing about Dragon Quest. 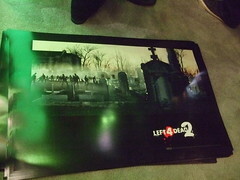 Oh, I got to check out a little bit of the new Left 4 Dead 2 they just announced. I also got a poster.